This projector has LEDs 192 distributed among the RGB (R 60 + 60G + 72B) colours. The control is performed in different ways (all accessible through a dip-switch block): Manual (individual and blended colours) mode, with execution of programs automatically by the sound captured by the internal microphone and DMX. 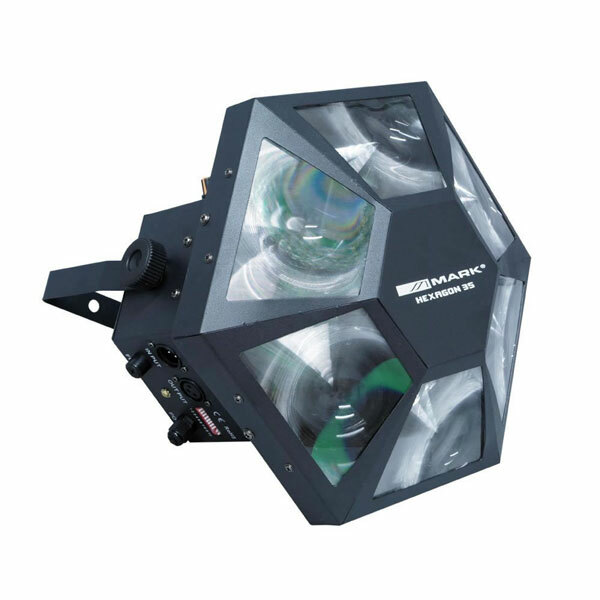 The hexagonal shape allows to distribute the light beams powerful and multicoloured, so it is suitable as a central focus of track in discotheques, pubs, indoor scenes, etc. Projector RGB LEDs 192 (60 R + 60G + 72B). Control modes: Manual, software, audio and DMX. 11 automatic programs + 3 audio programs. Interface mode selection screen and select buttons. Dimensions: 280 x 280 x 335 mm.